PREMIER 6 STAGE ALKALINE pH plus and ORP negative Reverse Osmosis Water system. 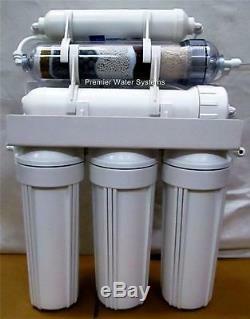 PREMIER 6 STAGE ALKALINE pH plus and ORP negative Reverse Osmosis Water Filters system. Best Value in the Market for this advance Premier Reverse Osmosis Water System with pH plus and ORP negative Water System. The Oxidation Reduction Potential (ORP) reading is an indicator of how bio-available and bio-absorbable a product will be in your body. The lower the reading below 0 millivolts (mv), the more ions are available to assist with your body's metabolic functions. A very high negative ORP is desirable because it is very useful at attacking dangerous free radicals and stops them from harming healthy cells in the body. He human body has a blood pH of 7.365 and it is essential to maintain this pH balance. Much of what we eat, such as processed sugar, meat, dairy, and coffee has an acidic effect on the pH balance. As an effect, the body has to work extra hard to restore itself to a neutral pH. Alkaline Water greatly assists in the balancing process by introducing a higher pH to the body to offset the low pH and therefore, the natural balance is reestablished. Alkaline Water also significantly helps the body absorb minerals because of its high oxygen content. This is highly important because, if the body does not have enough minerals, such as calcium, it tries to find it elsewhere and could potentially steal it from the bones in our body. This weakens the bones and could cause major problems later in life. The Premier Alkaline Filter has the ability to raise the pH of the filtered water up to 10.5! This is an amazing property of this filter because most calcite filters can only raise the pH to 7.5. Premier Mega Alkaline have the following. Negative Ion Ceramic, alkaline ceramic, Toumaline, Far infared Cermaic balls. Our Premier Alkaline Reverse System come with the following. 1st stage Sediment Water Filter. 2nd stage Carbon Block Water Filter. 3rd Stage GAC water filter. 4th stage Reverse Osmosis Membrane 75 GPD. 5th Stage Premier Mega Alkaline Infrared ORP negative pH plus Water filter 2.5" X 12". 6th Stage Carbon inline filter. Also come with Reverse Osmosis Faucet. Reverse Osmosis Storage Tank 3.2 gallon with storage capacity of 2.8 gallons. Color coded tubing for easy installaiton. Installation guide and Installation Help line 661 575 0033. This system is Made in USA. We have years of experience crafting our solutions for specific water sources in California. Our whole house water systems is designed to give you the best water quality from every faucet in your home. Setting ourselves apart from the competition, we use a three stage water system to clean, soften, and purify your water. A whole house filter, softener, and a reverse osmosis system. The item "PREMIER 6 STAGE ALKALINE pH plus/ ORP negative Reverse Osmosis Water system 75" is in sale since Sunday, June 2, 2013. This item is in the category "Home & Garden\Kitchen, Dining & Bar\Small Kitchen Appliances\Water Purification\Water Filters". The seller is "dhillonnoni" and is located in Canyon Country, California.